Doris the gorilla tries to make others respect her attachment to her blankie. 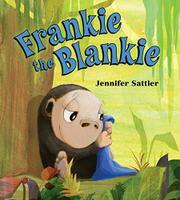 Although the title names Frankie the blankie, this is really Doris’ story. She loves her bright purple blankie, and all’s well until a rhinoceros passing by says “Only babies play with blankies, you know.” Embarrassed, Doris tries to do without Frankie; and then, bereft, she attempts to pass him off as other things—a hat, a bandage, a hankie. Mishaps ensue with other jungle animals, and some are hard to parse: when Doris pretends Frankie is a bandage on her foot, it’s unclear why a bird mistakes him for another bird and tries to kiss him, for example. Sattler’s vibrantly colored acrylic-and-digital art is the strength of this picture book, which ends up sending mixed messages about security objects as the plot progresses. When Doris hides Frankie and only takes him out in secret, a friendly lemur spies her and asks if Frankie is a puppet. Doris is inspired. “Yes it is!” she replies and then entertains the animals with a puppet show. The bullying rhino is included in this happily-ever-after ending, which isn’t quite satisfying. Was the rhino right after all? Is this a book to help ease children away from transitional objects? Or is it one that validates their attachments?